Colombia : When and where to go? Its proximity to the equator gives the Colombian climate uniformity in its temperatures: Globally speaking, the dry season lasts from December to March and the wet season, with strong rainfall, from April to November. However this general pattern is affected by regional geographic zones with a humid tropical climate in the Amazon, a harsher climate at altitude and more akin to desert in the Guajija. The best time to visit Colombia is during the dry season but avoid the weeks between the middle of December to the middle of January which is the favourite time for holidaying Colombians. Beyond the violent images portrayed so often by the media nowadays, the people themselves are generally surprisingly kind and the varied countryside is often grandiose in its views. Bogota is a paradoxical town: The contrast between the modernity of its architecture, the richness of its cultural life, the beauty of its monuments and, on the other side, the extreme poverty and street kids, will probably shock you. Recommended places to visit here include the Museo del Oro, the National Museum, the Santa Clara church and the José Celestino Mutis Botanical Gardens. Take some time to stroll around the markets and along the roads, in the Plaza de Santader and go up the Cerro de Montserrate, a site made famous by its miracles. The old colonial port of Cartagena has a fascinating historical quarter with churches, palaces, monasteries and peaceful patios, a great place to discover through wandering along its streets. The old port is equally worth a detour. Go into the jungle to explore the Ciudad Perdida, a town founded by the Taironas Indians, discovered in 1975, which makes a fitting finale to a hike of several days. For those seeking relaxation then Bahia Solano and El Valle, both on the Pacific Coast are the places for you with their magnificent beaches. If you feel like a little exercise then both towns make great starting points for exploring the jungle and the Parque Nacional Ensenada de Utria is the perfect place to observe whales and dolphins. 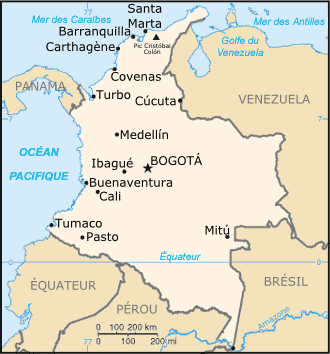 Various international airlines serve several Colombian airports. European citizens do not require a visa for a stay of less than 60 days. The currency in circulation is the Colombian Peso. The budget you should plan for is fairly moderate: A meal will cost less than €15 and a room less than €10. Concerning health precautions, your vaccinations should be up to date and add hepatitis A and B, yellow fever, typhoid and rabies too if you plan to visit the rural areas. Take medicine with you for malaria which is present in certain areas. Travelling inside Colombia can be done in several ways. Internal flights are frequent and practical. Taking the bus in an option both economical and efficient and taxis are inexpensive in town and will take you for longer trips. If you want to take some souvenirs home with you then local arts and crafts items are popular including cloth, pottery, jewellery and wickerwork or you may prefer to purchase some of the beautiful famous local emeralds from either Bogota or Cartagena.